Kevin asked me to chime in with some Chikara themed blogs for the 31 days of Halloween theme he’s running this month. I have to admit because I took a year off from Chikara and have only seen about half the shows from this year, my Chikara knowledge is fuzzy. So if I make any mistakes, I’m sure a loyal reader will let me know. 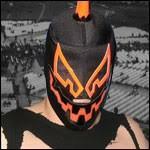 For the first blog, I decided to go with Chikara’s first Young Lion’s Cup winner, Hallowicked. Hallowicked made his debut on the first Chikara show and has been a staple of the main roster ever since. Hallowicked initially formed a tag team with Blind Rage collectively known as Night Shift. Night Shift won the inaugural Chikara Tag Team World Grand Prix tournament in 2003. 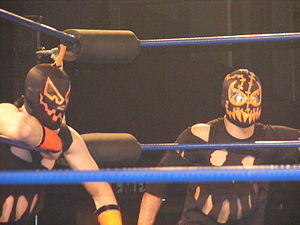 At the 2006 Tag Grand Prix, Hallowicked’s partner Ultramantis Black was sidelined with an injury so a replacement partner was drawn from a hat. That partner turned out to Delirious. Hallowicked and Delirious found success as Incoherence winning the Campeonatos De Parejas from Team F.I.S.T. in October 2007. Incoherence would hold the tag straps for almost eleven months before losing the titles to the Super Smash Brothers in September 2008. Delirious would eventually become brainwashed by Ultramantis Black and turn on Hallowicked. By the time Delirious deserted Hallowicked, Incoherence had a new protégé in Frightmare who has become Hallowicked’s regular tag team partner. In addition to being a successful tag team wrestler, Hallowicked has also had several high profile singles feuds. One of the best was his feud with Eddie Kingston over who was the best graduate of the Chikara Wrestle Factory. Currently Hallowicked is a part of the 12 Large Summit, a tournament to crown Chikara’s first ever single’s champion. The finals of the tournament will be part of Chikara’s first Internet PPV on November 13. For more on Hallowicked and Chikara check out www.chikarapro.com. For more my123cents visit our Facebook or Twitter pages.